I have been in that mode where you just deal with one thing at a time. Whatever is the next event on your calendar gets all of the attention. Now that we are down to the wire with the end of the school year, it is time to start planning for Summer. Time to relax and enjoy the next three months off with my kids. 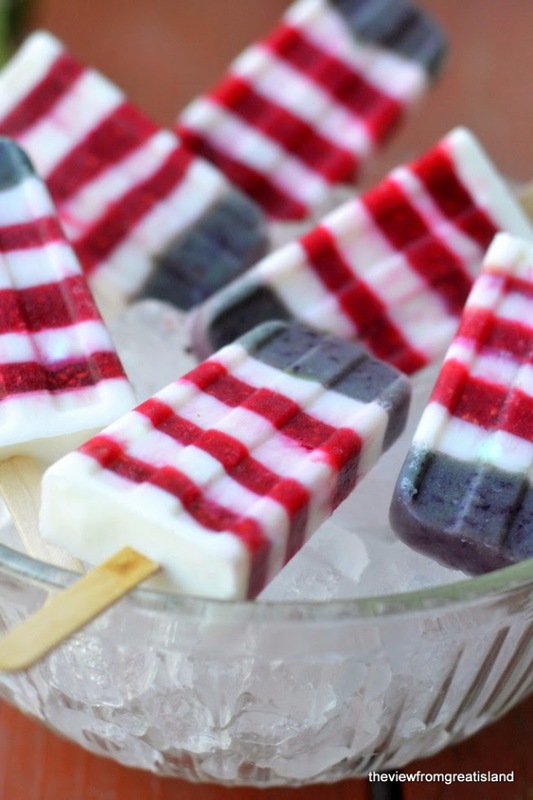 And until I saw these fun red, white, and blueberry popsicles I hadn't even started thinking about the 4th of July. I love the 4th of July and just looking at these beautiful stripped popsicles makes me happy. I need to buy a better popsicle mold so we can make our own flag popsicles!! We might have to try out a few of the other striped popsicles from this site too! You can get all of the details for these patriotic popsicles and even more great popsicle ideas over at The View From Great Island.